What is the Strategic Map of Industry? This new version of the Strategy Map for Industry identifies the biggest challenges to be addressed by industry by 2022 as a result of changes in the global and domestic economic environment over the past five years. The document is an agenda for the development of new competencies and structural changes in Brazil, considering the new international and domestic economic environment presented in the last five years. 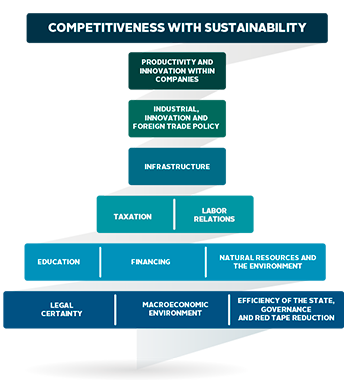 Brazil has been consistently losing positions in the global competitiveness ranking of the World Economic Forum. It dropped to its lowest position in 10 years in 2017. Brazil’s loss of competitiveness jeopardizes its economic growth and capacity to generate jobs and income. The Brazilian industry needs to concentrate efforts in being competitive, reaching new markets, creating jobs and income and boosting economic growth. Productivity is a major determinant of competitiveness. Over the past ten years (2006-2016), Brazil recorded the worst evolution in productivity among its 10 main trading partners. According to CNI (2017a), during this period labor productivity in Brazilian industry increased by 5.5%, while in the US it grew by 16.2% and in Argentina by 11.2%. This causes the Brazilian industry to lose competitiveness both in the international and in the domestic market, where imports from its competitors have been on the rise. 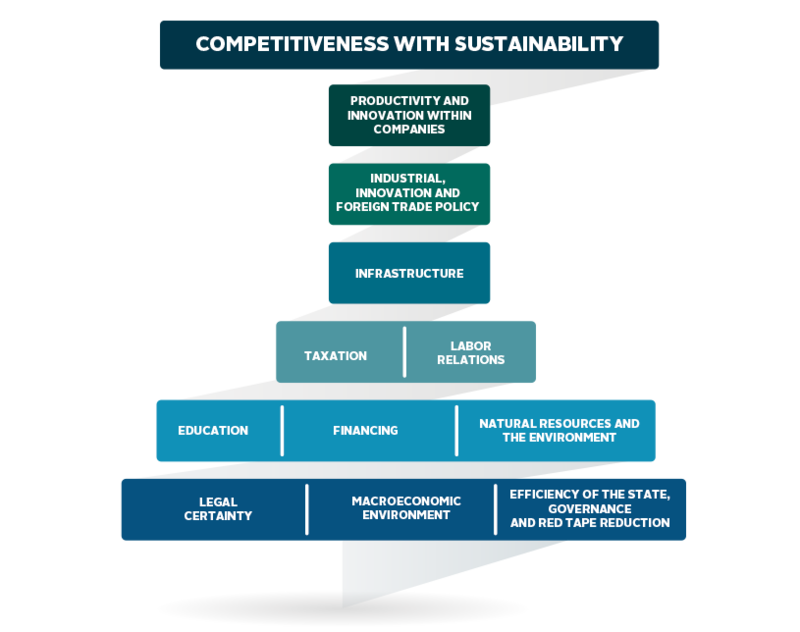 The Strategy Map for Industry consolidates an agenda of challenges that takes into account global and national trends. The agenda proposed in the Map is of a dual nature. It involves both old bottlenecks yet to be overcome and challenges to be faced for building the industry of the future. The widespread use of digital technologies and their application to industry have an impact on the entire value chain of products from their development to consumption and disposal or recycling, as well as on business models and patterns of trade integration. Currently, the largest source of wealth for the economy as a whole is also the foundation on which competitiveness gains for companies and countries are based. so-called low-carbon economy. In addition, changes are taking place in consumption patterns at an ever-faster pace as consumers become more concerned with the environmental impacts of products and of their production processes. out. Despite this uncertain scenario, there are forces pressing for the identiﬁcation of global markets that generate opportunities. The growth seen in Asian economies and their exports suggests that the Paciﬁc has become a major engine of the global economy. Political and economic crises have revealed the “swelling” of the Brazilian state, the exhaustion of its capacity to grow and the need to review the relationship between the private sector and the state, with impacts on the design of industrial policies. Reforming and reinventing the state is a necessary condition for overcoming the economic, demographic and social challenges facing us in the present and future. important for economic growth, given the slower rate of increase in the working-age population. The size of the Brazilian consumer market continues to be one of the great assets of Brazil and an investment-attracting factor. Nevertheless, the country cannot ignore the external market and must increase its operations worldwide. Brazil has been experiencing a slight regional deconcentration in favor of the development of medium-sized cities, which have been attracting companies looking to reduce costs associated with large agglomerations. A more educated population, greater access to information and more professional institutions tend to put pressure on the state to adopt more transparent management arrangements. This leads to the adoption of more effective, judicious, evidence-based and results-focused public policies.